Bryan Wallen, social studies teacher at J. H. Rose high school, participated in Fall 2012’s National Day on Writing. While his studies moved around campus, writing and thinking in different spaces, Bryan stayed in Joyner Library and worked with teacher consultants from the Tar River Writing Project on a professional development event focused on genre and how we can teach genre-based writing across the curriculum. What follows is Bryan’s account of how he took the activity back to his classroom! Getting students to write has been the focus of the social studies department at my school during this current school year. Most of my colleagues who teach advanced placement or honors classes have always had their students write because it was part of the evaluative process. However, most standard classes do not emphasize writing. There are several factors that explain this, but for the most part it is because the students in these classes read and write at least two grade levels below their current level. Other than English classes, they usually will not write a full essay for an assignment. Over the past two years, I have been attempting to introduce more writing in my class to reinforce the notion that written expression is the only way most colleges will evaluate their students. As an experiment this fall, I assigned writing prompts and activities in lieu of a standard twenty-five question quiz on the First World War. After covering a particular topic or chapter, I would generally assign a note quiz to my class. The quiz would always be multiple choices and have maybe one short answer response. This time I decided to take the ideas I got from East Carolina University’s Tar River Writing Project to gauge the level of understanding this class has on World War I. Below is the assignment I gave my standard United States History classes. Directions: Use the following prompts to create two writing samples about World War I. Trading Card for the major players of the war. They had to choose at least two different styles. I would not allow them to write two raps or two haikus. I also found I had to introduce or reintroduce haiku to my students. I assigned these types of assignments over the regular document-based questions or free response questions that I normally assign from time to time. 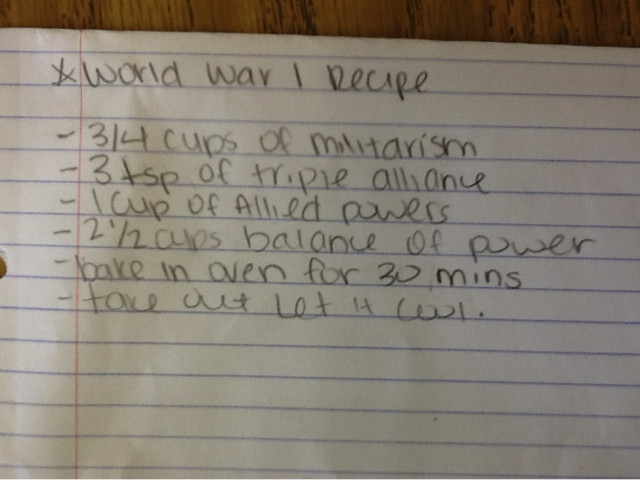 A few of my students tried writing a recipe for World War I, and for the most part, the recipes were very accurate. They dealt with the causes of the First Word War, which are concepts that are usually hard to get across. Other students tried writing and creating worksheets and found it was a bit more challenging than they thought. 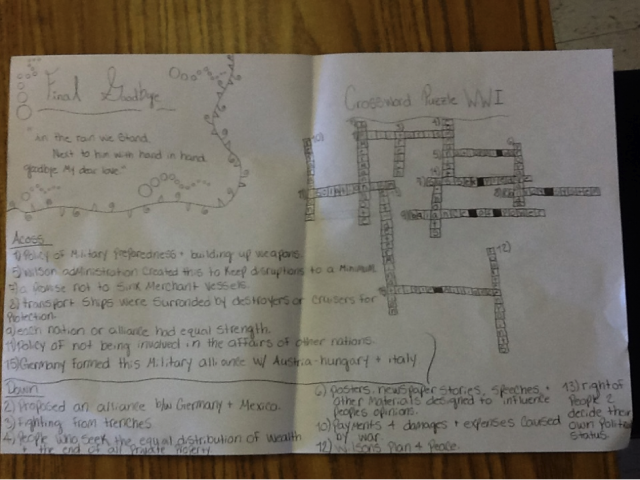 One student went as far as creating a crossword puzzle complete with clues. I was surprised so few tried to write raps. When I told them they could do a rap, most were excited until they found out that it is not as easy as it sounds. My goal was to get my students to realize that there are many forms of written expression other than an essay. I wanted them to think about what they wanted to write about and how they wanted to convey what they learned to me. By doing these types of writing prompts I hope my students will not only be better writers, but also better readers. The students read and write all the time in my class, but with these ideas and concepts, I hope to convey to my students the importance of both skills in everyday life. I also wish to instill a sense of what will be expected of them if and when they attend college.